We rewatched the highest scoring game in March Madness history. Here’s what we learned. 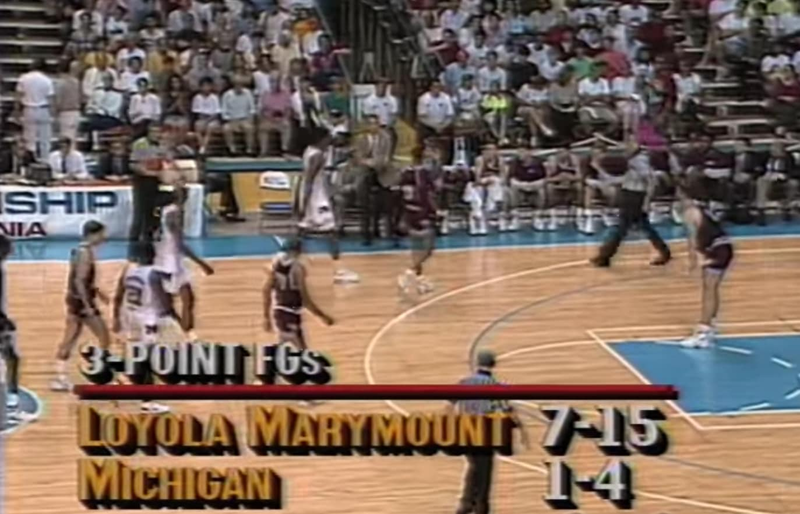 Twenty-nine years ago today, on March 18, 1990, Loyola Marymount beat Michigan 149-115 in the second round of the NCAA tournament. With 264 total points, that game still holds the record for the highest-scoring final in NCAA tournament history. So, we watched the entire thing to see what we could learn from it. 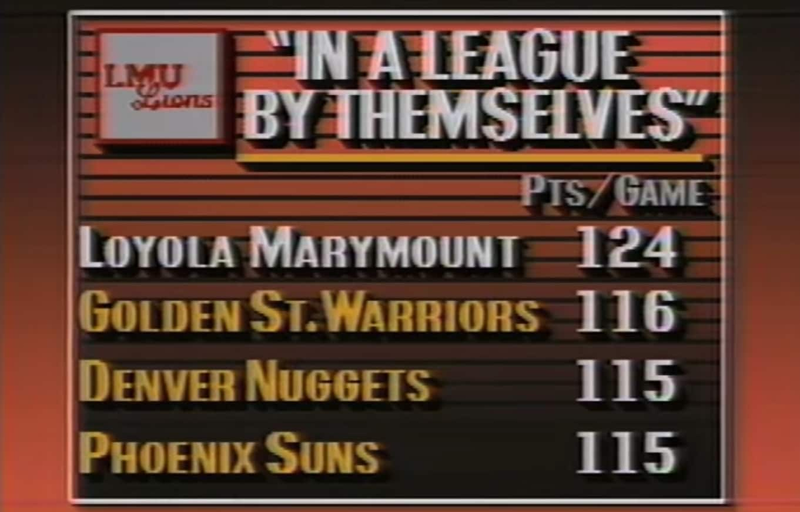 If you look at any one segment in this game, it's easy to see how these teams combined for 264 points, but none shows it better than this segment. 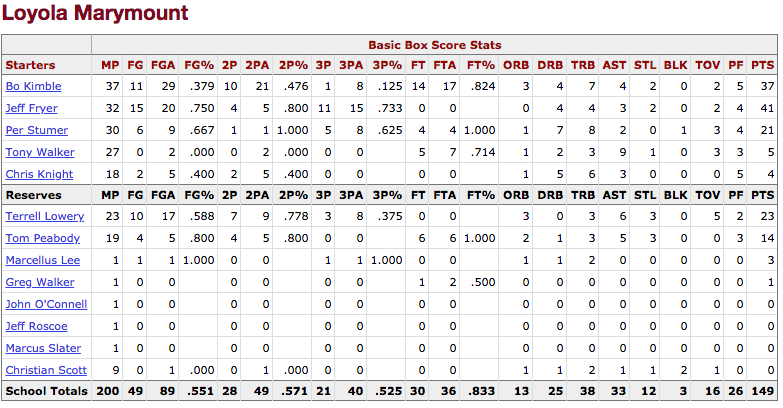 Seven possessions, seven shots, seven baskets. Yeah, these guys were hot. Watching the end of the game, it's easy to see that the record could have been even more unbreakable. With five minutes left, LMU pulls the ball back and goes to a four-corners offense. It just seems… wrong. LMU's Jeff Fryer finds himself on a 2-on-1 fast break, but steps back behind the line for a wide open 3-pointer and nails it with 1:30 left in the game. It’s his 11th of the game, which is a record that still stands. He would have 41 points without ever going to the free throw line. With 16 seconds left, Kimble fouls out. The nation’s leading scorer has 37 points. From the crowd's reaction and Kimble immediately being swarmed by his teammates, you can see how close this Lions squad is. One more for the road? Why not. Marcellus Lee gathers a rebound off of a missed free throw, and looses a wild 3-pointer. It's good, and we have a final score: 149-115. Loyola Marymount averaged 122 points per game this season. Michigan, 86. It was clear that this would become a battle of tempo, but Michigan decided to play to Loyola Marymount's speed, wanting to unleash their star players (four returning starters from the 1989 championship team) instead of slowing down the pace. This is exactly what LMU wanted, and it doomed the Wolverines, who ran out of gas in the second half. Michigan was actually fairly adept at breaking LMU's full-court press, but once they broke it, they tried to capitalize on the chaos of the break, taking quick shots instead of pulling back and running a halfcourt set. Loyola Marymount could not be stopped from behind the arc. The Lions were 21-40 from 3-point land, while Michigan was 4-13. That's pretty impossible to overcome, regardless of pace.